It's both spicy and sour and loaded with pork and mushrooms. 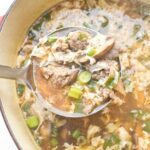 Skip the take-out and make this Homemade Hot and Sour Soup at home! In a saute pan on medium, cook ground pork until done, crumbling as it cooks. Approximately 7-10 minutes. With a slotted spoon, remove pork from pan onto a paper towel lined plate and set aside. Meanwhile, over medium high heat, add 7 3/4 cups of stock to a dutch oven or large pot with mushrooms, 1/8 cup of rice wine vinegar, ginger, chili garlic sauce, and soy sauce. Bring to a simmer. Whisk the cornstarch with the other 1/4 cup of chicken stock. When stock comes to a simmer, stir in cornstarch stirring continuously until soup begins to thicken. Gently drizzle the whisked eggs into the soup while stirring the soup continuously creating egg ribbons. Add pork, green onions, sesame oil, remaining 1/8 cup rice wine vinegar, and white pepper. Serve immediately and add more chili garlic sauce (and or Sriracha) and rice wine vinegar to taste.